Make the rosemary vinaigrette. Put the minced onion, mustard, salt, vinegar, garlic and rosemary into a blender and pur?e it for about 30 seconds. Use a spatula to scrape down the sides of the blender and puree it again for 10-20 seconds. Scrape the sides down again. Turn the blender on low and take the removable cap off the lid. Hold your hand over the hole, as it might spit a little. Pour the olive oil in slowly and put the cap back on. Turn the blender off and scrape the sides down one more time. Turn the blender back on low, then high for 60 seconds. Rinse the fish under cold water. Now make sure its gills and scales are all removed; your fishmonger is not always so diligent about this task, and no one wants a scale on his plate. Gills can impart a bitter taste to the fish, so they need to go, too. Use a very sharp knife and make several slashes on the sides of the fish, maybe every inch or so. Make the cuts at an angle to the side of the fish, and slice down until you feel the spine. Do not sever the spine, however. These cuts will help the fish cook faster. Rub olive oil all over the fish and set it aside. Prepare your grill for high, direct heat. Scrape down the grates well and close the lid. Salt the fish well. Now grab a paper towel, a set of tongs, and some cheap vegetable oil. Fold the paper towel over several times, moisten it with the vegetable oil, and hold it with tongs to wipe down the grill grates. Lay the fish down on the grill and close the lid. Let this cook for 5 minutes without touching it. Open the lid and, using tongs gently see if you can lift the fish off the grates cleanly. Don't actually do this, but check for sticky spots. If you have some, get a metal spatula. Use the spatula to dislodge the fish from the sticky spots. Using tongs in one hand, and the spatula in another, gently flip the fish over. Once the fish has been flipped, let it cook another 3-5 minutes. Again, test for sticky spots with the tongs and spatula. Dislodge them gently and gently lift the fish onto a plate. If the fish is too long or seems like it might break in half, use two metal spatulas instead of the tongs-and-spatula set-up. Drizzle the vinaigrette over the fish and serve at once. European Seabass or Loup de Mer is a farm raised sea bass also known branzino, branzini or wolf of the sea. Our fresh Loup de Mer are imported directly from the beautiful pristine waters of Greece. Farmed in the sea, these are the highest quality branzino available in the market. This Mediterranean specialty has a firm, white, flakey meat with a mild yet sweet flavor. European Seabass is a wonderful fish with an exquisitely sweet and mild flavor. With pure white flesh and a flaky texture, this farm raised beauty is a favorite of chefs around the world. Perfect for a variety of whole fish preparations, European Seabass also yields delicate fillets that are wonderful in a variety of preparations. Alternatives include farmed striped bass, black bass or smaller snappers. Try serving this little gem whole - stuffed with fresh herbs, baked in a salt crust or any way you can imagine. Whether you follow the French who call it Loup de Mer, or add an Italian twist and call it Branzino, this great fish has consistent availability and should find a place on your menu. European Seabass (Branzino or Loup de Mer) is considered a "Best Choice" by the Monterey Bay Aquarium because these systems have minor environmental impacts. Loup de Mer (Branzino) is an excellent substitute for any recipe that calls for Seabass. Use your fresh European Seabass fillet within 2-3 days of arrival otherwise freeze them. Two 5 to 6 ounce fillets are included with your order. Baked, broiled, or grilled, our whole branzino is packed with flavor! Anderson prides itself on a holistic approach and so from engaging suppliers who use best practice methods to farm the European Sea Bass, to utilising a zero carbon method of delivery, we enshrine the virtues of quality product, consumer satisfaction and eco friendliness. 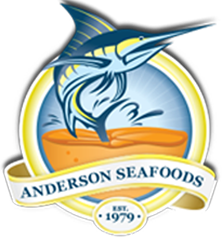 Any fish can come from the sea, lake or pond, but a European Sea Bass fillet from Anderson foods is sent to your plate from heaven. Remember to utilize your European Sea Bass fillet within two to three days of receiving it or freeze it.